Let me confess: my first day of the Week of Eating In was actually Sunday, one day before it officially began. On that day, I managed to leaven two loaves of bread, which would later be baked, roast two trays full of root vegetables, which could be snacked on like popcorn or put into more formal preparations with a little warming up, simmer some tomato sauce from a can of whole plum, and make a pot of stock and some soup with most of it. And I went shopping, too, though the brunt of it was on Saturday, picking up bulk plastic bags of produce like apple and turnips at the Greenmarket. I did about enough to keep me going for two weeks of eating in, over the weekend. I’m still thinking that some of this bread may end up for the birds, or at least, as breadcrumbs. Preparation is everything, whether it’s for entering a meeting or meeting your daily caloric intake. How odd that for many of us, we’d more eagerly prepare for business relationships than the relationship that we have with food, and hence, our bodies? I was reminded of all the extra measures I took every day to prepare this, my food, while not eating out for two years straight: I couldn’t leave the apartment until finding that I had both my keys and my lunch. And how, in the year or so since I’ve quit the straight not-eating-out routine, I’d frequently feel like I’d forgotten something when dashing out. It’s an everyday feeling of responsibility and self-empowerment, eating in, and it all came back to me acutely during this week. Ordinarily, an assortment of vegetables, or even just carrot, onion and celery, the basics, were fine for making a savory vegetable stock for me. This I’d keep frozen for later uses like in soups, braises and risotto, and I’d just run out of a batch of it before the Week of Eating In. But something told me this week called for something special. So I took out the last chicken from the freezer, and simmered it for a couple hours into a hearty chicken stock. Yes, there were chickens in my freezer, and this was the last one remaining from a shoot-out on Queens County Farm Museum almost a year ago. At least, I think that’s what kind of birds they were. You see, I used to date the director of agriculture there, Michael Robertson, and one day he decided to get rid of a bunch of stray birds (yes, there are stray birds like chickens, roosters and geese in NYC) that were hanging out on the farm, with the help of Tom Mylan, butcher from The Meat Hook. I was spared what I’m sure was a horrific scene — Tom, with a cigarette dangling from his mouth wielding a BB gun, and Michael trying to keep the squawking birds in a contained space so as to be easy targets — but I was not spared their hunt, which Michael gave me shortly afterward, in frozen packages. We had a horrible dinner party in which I tried to cook some of them (not horrible because the company was, but because the food was, a first — those birds were pretty old and their meat incredibly tough). And then I left the last few birds tucked away in the fridge, almost forgetting about them. 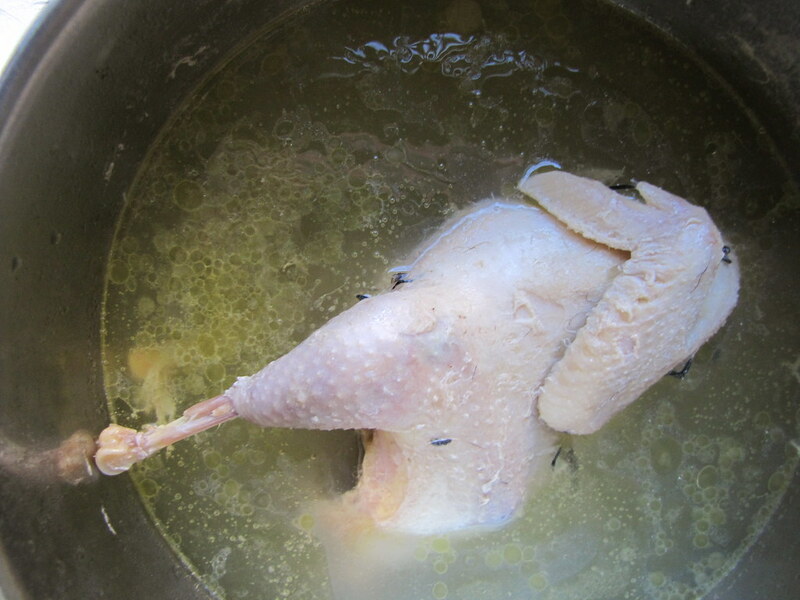 Once I had about a gallon of chicken stock, I quickly got started on making soup. In a separate pot, I sweat some onions, carrots, celery and fennel stalks (leftover from the day before’s salad), and cooked some cannelini beans that had been soaked overnight until almost tender. Into the soup also went some diced turnips, parsnips and leftover fresh parsley and thyme, some homemade tomato sauce, and I’m sure many other things I’m forgetting. Oh yes, a couple Thai chiles from a class I taught at The Brooklyn Kitchen a couple weeks ago; a rind of Parmiggiano-Reggiano Karol gave me on my birthday. Some chopped olives, from a container that I’d been snacking on ever since the Moroccan cassoulet, and the last cupful or so of honey butternut squash soup. Isn’t soup-making fun? It’s like all your recent life, in a pot. It turned out I made enough soup for an army, so I kept about a pint to myself before freezing the majority, and giving another pint away to friends. But, to make room in the freezer, I removed from it another food find: a single-portion sized container of leftover coq au vin with buttery mashed potatoes. I’d made this meal on a quick getaway with friends over Valentine’s Day weekend, and even though there was only enough remaining after a big meal together to feed about one, I brought it back in any case, and immediately stuffed it into the freezer once home. So when I left home for the office on Tuesday, I brought this along with an apple, and some soup and bread for a quick dinner, later on. I knew I wouldn’t have time to stop at home before having to go to my commitment that night, co-hosting a food documentary screening called Hungry Filmmakers. 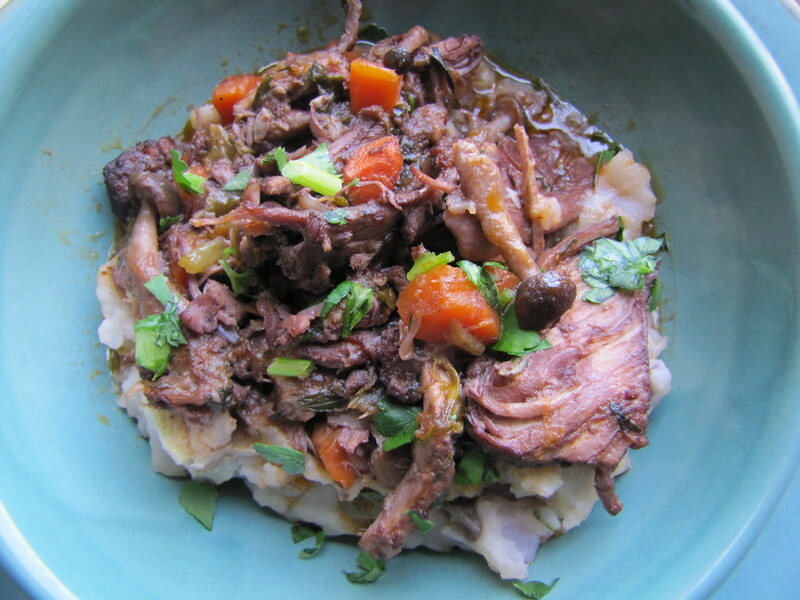 The coq au vin was defrosted and reheated up for lunch; not too shabby indeed (pictured at top). 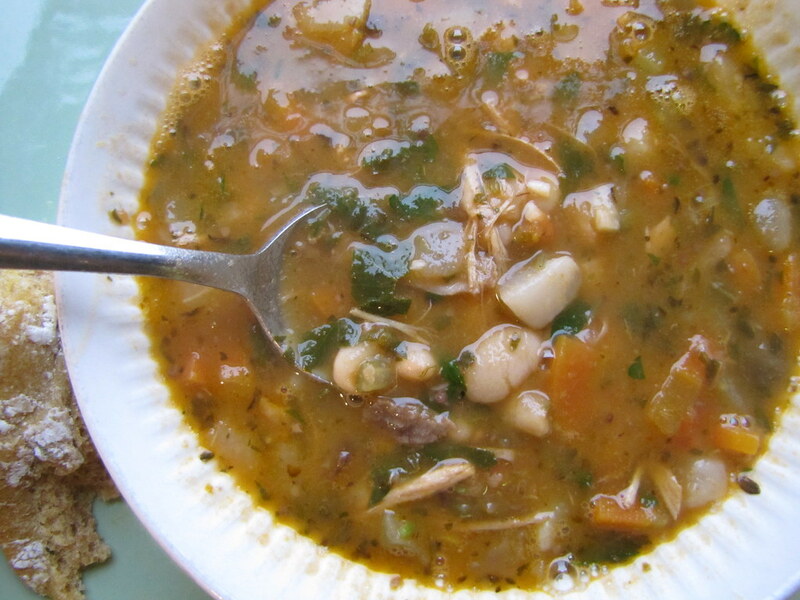 It was rich and satisfying, but then so was my early dinner of soup, and slices of whole wheat no-knead bread. No, I wasn’t too sad at all when I couldn’t enjoy the refreshments at the film event, which happened to include a last-minute sponsor, Slice pizza, which I had never tried. For the second night in a row, the temptation of readily available pizza was right before me. But I was plenty full by then, and kept myself occupied with the schmoozing and sipping during the reception. And when the party moved on to Jimmy’s No. 43, where I was promised there’d be plenty of snacks floating around by Jimmy himself (before clasping a hand over his mouth, remembering my week-long fast), I politely declined; for the second night in a row, this just sounded too delicious an event to pass up on the food should I be taunted with it, before my face. So I took the subway home instead, and called it a night. Day Two of Eating In, done! I’ve heard this phrase before but have no idea what it means. Exactly what does “sweating vegetables” entail? Oops, sorry for the lag! 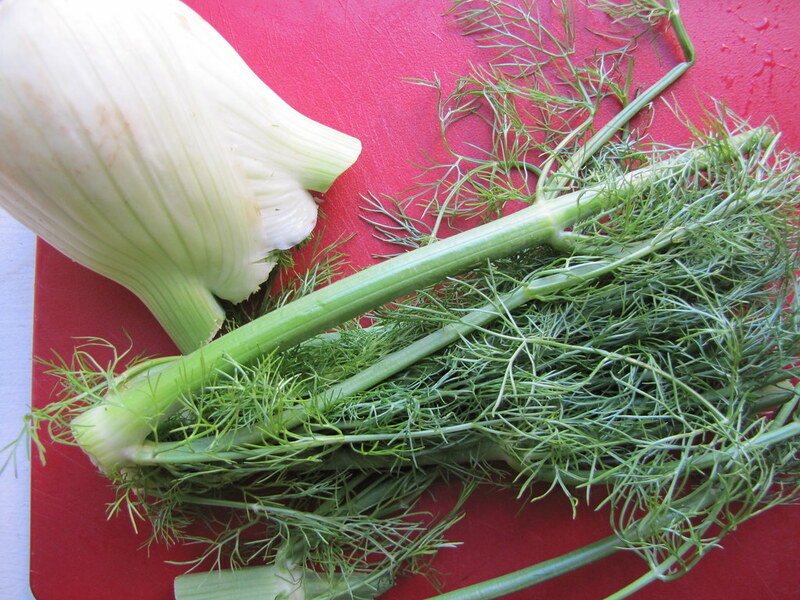 “Sweating” is basically softening aromatics like onion and garlic over low heat until they turn translucent. Hope that helps!